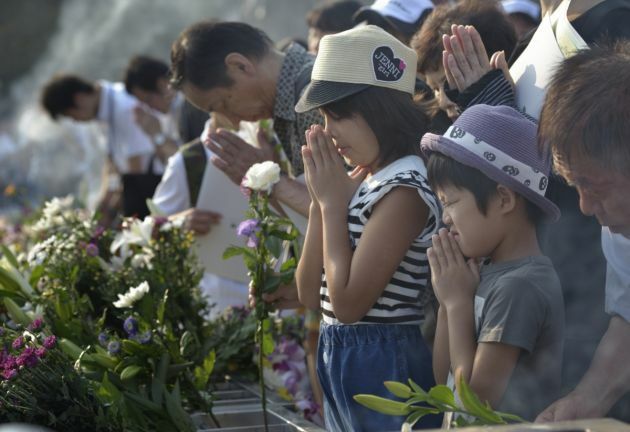 (Photo: WCC / Paul Jeffrey)People pray of all faiths pray at a memorial in Hiroshima, Japan for the victims of the atomic bombing of the city by the United States and its allies in 1945. A delegation of pilgrims from the World Council of Churches was in Hiroshima for the commemoration , and they are building a movement to rid the world of nuclear weapons. World Council of Churches general secretary Rev. Olav Fykse Tveit has expressed thanksgiving for a treaty to ban nuclear weapons that was formally opened for signature. The United States, Britain, France and others, including Australia, boycotted the event at the annual United Nations gathering of world leaders on Sept. 20. The treaty on the prohibition of nuclear weapons will enter into force 90 days after 50 countries have ratified it, Reuters news agency reported. "There remain some fifteen thousand nuclear weapons in existence. We cannot allow these doomsday weapons to endanger our world and our children's future," U.N. Secretary-General Antonio Guterres said as he opened the treaty for signing. At the time of writing, some 49 states have signed. Tveit said, "By signing the treaty today, these nations have taken a lead in protecting all our countries and the planet that is our home." He urged national leaders to quickly ratify as well as sign the treaty. "This new treaty has to potential to save millions of lives, and creation itself, from the most destructive and indiscriminate weapons ever developed by human beings," said Tveit. The text of the historic new treaty was adopted in July by two-thirds of the 193 UN member states after months of talks. It bans the manufacture, possession and use of nuclear weapons and provides pathways for their eventual elimination. As well as prohibiting nuclear weapons, the treaty also requires the provision of aid to victims and environmental remediation. The WCC is among the many groups and governments that have worked toward this development in international law for more than six years. Three of the first nations to ratify the treaty on the same day it opened for signature were the Holy See, Thailand and Guyana. Dr. Emily Welty, vice-moderator of the WCC's Commission of the Churches on International Affairs, attended the treaty's opening and signing ceremony. "This treaty represents the moral courage of the international community – and an active partnership between a wide range of civil society organizations and governments – to condemn one of the most horrific and morally indefensible weapons of our time," Welty sadi. "We commit ourselves to continuing to work for a world free of the threat of nuclear weapons."